Pastels with more pastels and nudes are my favorite. These jeans are my favorite thing in my draw right now. Okay, one of my favorite things in my draw right now. I wear these pretty much every week and never with the same thing. I'm also glad that I remembered that I had this bag. It was stored away with all my other random bags and scarves. I couldn't remember when I bought this bag, I knew I got it around Christmas one year since my uncle use to always get me a Coach gift card, but remembering when I actually got was tricky. Thankfully, I save receipts and lots of random pieces of paper in my bags that I came across a coupon for a McDonalds Hot Cocolate and it expired in 2009. So I bought this bag back in 2009. I still love the pastel purple and that it is big enough to hold books and magazines, which is fantastic since my iPod is broken and I need something to do on the train ride. I ended up in Barnes and Nobles today during lunch time, I picked up the Kelly Cutrone "Normal Gets You Nowhere" along with two writing books. I already starting digging into one of the writing books, I'm a total nerd and I'm okay with that! Is there an article of clothing that you wear every week? Well they are fabulous jeans so you are free to wear them as much as you want :) Love the shoes! Your jeans are fabulous but what really caught my eye are your shoes and pendant. How incredibly gorgeous! 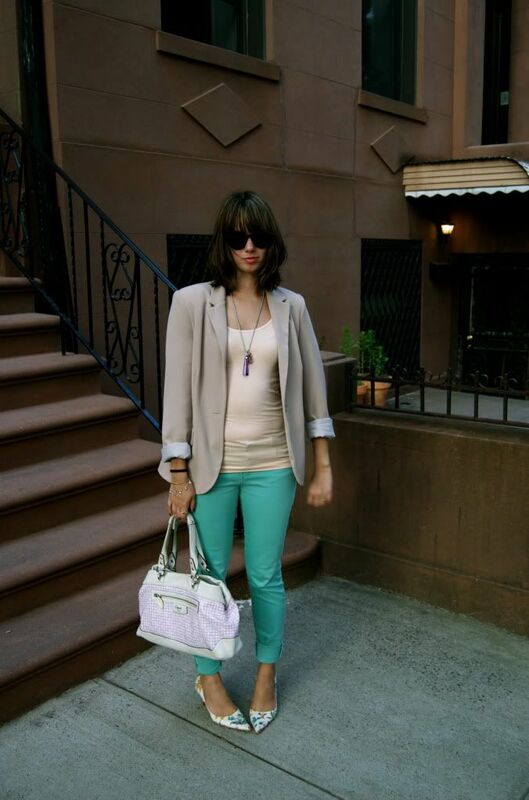 I really love the color of those pants, and those shoes go so well with them! it's great that the jeans are so versatile, its such a great color. 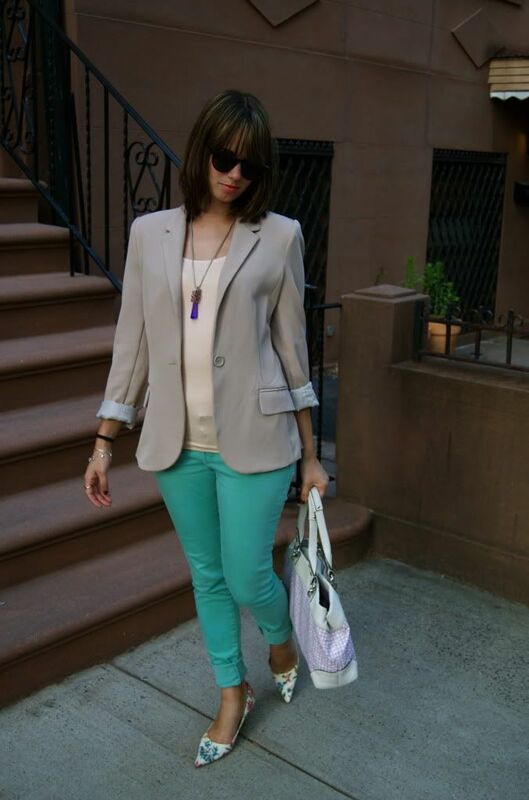 im loving the mix of nudes, pastels and the pants just gives it enough edge, great blazer! 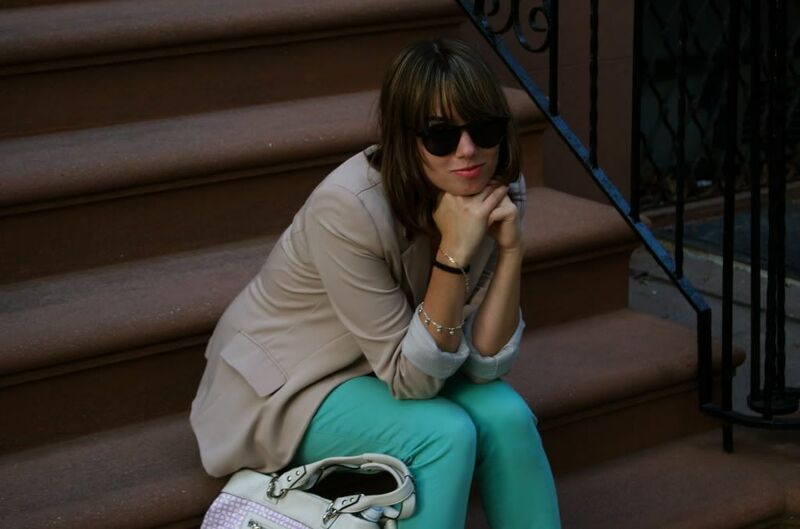 You're an inspiring blogger, you know that? Every visit, I come away with another idea! 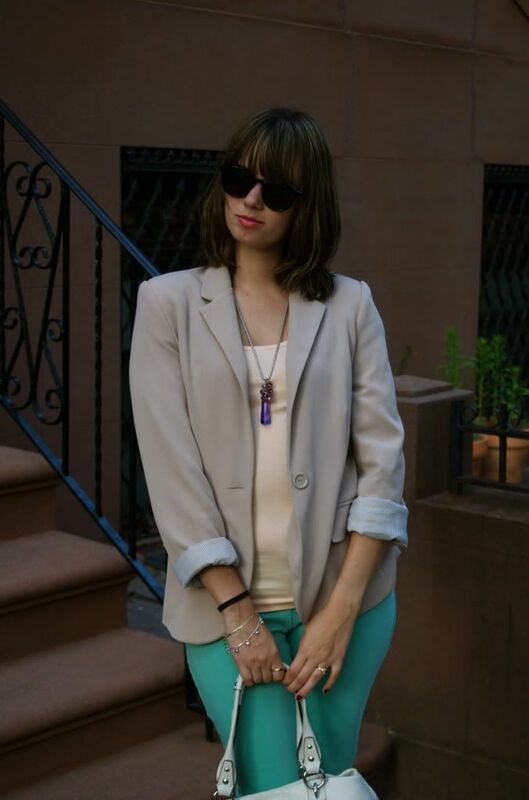 I haven't gotten into the colorful bottoms yet, because I haven't seen how well they can be done and now today I've seen two looks that rock (you and Elaine over at Clothed Much)! 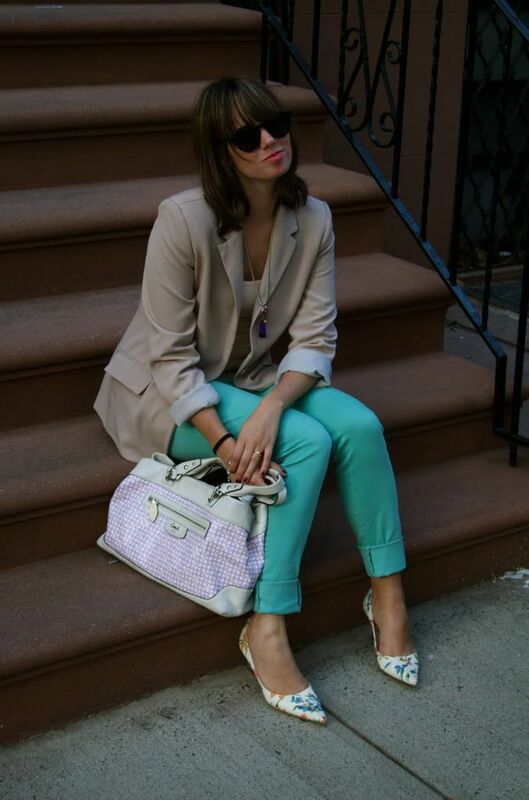 loving those mint color pants! I love those jeans, especially with those cute shoes !